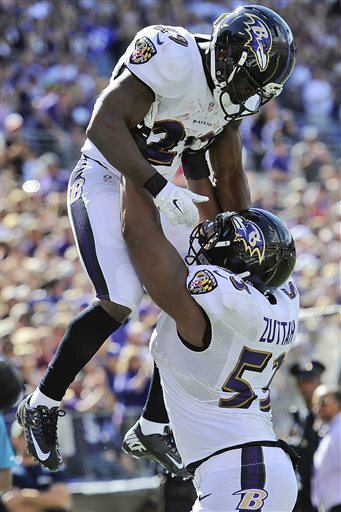 Jeremy Zuttah lifts Justin Forsett high into the air after a touchdown. This is a feelgood story, if you do not want to feel good about sports then stop reading now.Born in Lakewood Florida he moved to Arlington Texas when he was a sophomore in high school where he attended Grace Preparatory Academy. In his Jr. and Senior years he was the star running back and rushed for 63 touchdowns and close to 5,000 yards. His father was a minister and a football coach, and his son received the nickname of “The Truth” for his religious beliefs and his running prowess. Then it was off to college, where close to the national signing day Notre Dame pulled his scholarship, actually going as far as to lie and say they never offered him a scholarship. Later, Buzz Preston, Notre Dame’s running coach would admit that they wanted a taller running back. They were not the only ones, the hometown Texas Longhorns said he was to short and also declined to offer him a scholarship. Former NFL player Mike Barber was the coach at Grace Preparatory Academy and began using his connections and showed the video tape of his running back to everyone he knew. Cal coach Jeff Tedford on a tip from Cal great Chuck Muncie viewed his tape and then offered the running back the last scholarship for the 2004 recruiting class. 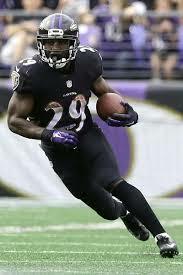 Baltimore Ravens running back Justin Forsett. So he went to Cal. But Cal was a big school and lots of talented running backs went there. One was named J.J. Arrington, and he was the starter. But the running back who got the last scholarship did see some time on special teams blocking for another running back you may have heard of, Marshawn Lynch. Next year Arrington moved to the NFL and Lynch became the featured back. But Lynch was injured in the first game of the year against New Mexico State and the back with the last scholarship ran for 235 yards, the 4th highest single game rushing total in school history. In his Jr year he continued to be the back-up to Lynch. But lynch did miss 1 games that year, and the back-up running back ran for 100 yards and a win against Oregon. As a senior and the featured back he rushed for 15 touchdowns, 1st in the Pac-10 and 1,546 yards, 2nd in the Pac-10. Those accolades earned him to the all Pac-10 Conference 1st Team and his team a trip to the 2007 Armed Forces Bowl where he ran for 140 yards and 2 touchdowns in route to a 42-36 victory over Air Force. Then he was drafted in the 7th round of the 2008 NFL Draft by the Seattle Seahawks. He started his first game, a preseason game against the Chicago Bears. The Bears amassed a total of 206 yards of total offense. The running back selected in the 7th round amassed a total of 261 all-purpose yards in the game by himself. But, he was waived by the Seahawks three weeks later. The very next day he was picked up by the Indianapolis Colts, and was waived less than a month later. The very next day he was signed by Seattle again, but to their practice squad. On October 14th 2008 Seattle moved him to the active roster and he became the return specialist. In 2009 he was in a crowded Seattle backfield with Julius Jones and Edgerrin James. Then Seattle released James and he was promoted to the #2 back. On November 15, Julius Jones, the starting running back for the Seahawks, left a game against the Arizona Cardinals with a bruised lung. Filling in for Jones, he rushing for 123 yards and his first regular season touchdown. He started as the primary running back on November 22 game against the Minnesota Vikings, scoring his second touchdown on a 9-yard run. With the Seahawks’ running game struggling, he also caught 8 passes for 80 yards. On November 29 against the St. Louis Rams, he rushed for a career high 130 yards and two scores. With the return of Julius Jones in week 13 against the San Francisco 49ers, he was relegated back to the position of 2nd-string running-back. He saw only 8 touches, rushing for a net gain of 9 yards, a reception of 25 yards, and one touchdown. In 2011 when his contract with the Seahawks expired, so did his time with them. He then signed with the Houston Texans on June 2, 2012 on Thanksgiving Day, 2012, for his new team he scored an 81-yard touchdown, the longest running play in Texans history. He signed with the Jacksonville Jaguars on March 15, 2013. He was subsequently placed on injured reserve on December 9, 2013 due to a foot injury and released on March 11th, 2014. Signed this season to again be a 3rd string running back behind Ray Rice and Bernard Pierce, Justin Forsett just received AFC Offensive Player of the Week honors, again. Forsett won the Week 10 award after rushing 20 times for 112 yards and two touchdowns against the Tennessee Titans. Forsett topped that on Monday Night Football, running 22 times for 182 yards and another two touchdowns. Then I realized he did this for his wife. Lastly, if you go to Justin’s twitter account, https://twitter.com/JForsett you will see he gives his followers verses of the day.